Well I'm about to disappear on a surprise trip for a week but I took a little time to pour a couple of the molds. 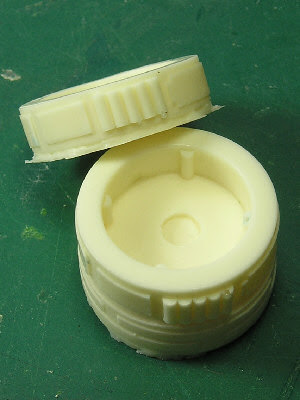 Firstly the one piece molds of the engine mounts. 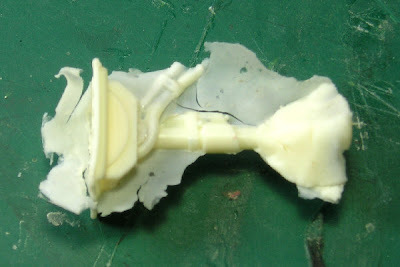 This is a second cast from them and I used a cotton bud to 'paint' resin around the inside of the mold before I poured. This seems to have done the trick and has removed 90% of the problem I had with air bubbles. Yay Result! Next comes the tail plane. This looks quite promising - not a single bubble in sight, and a very smooth cast. Some flash to remove, and of course the problem with the RTV that flowed under the master, But I'm confident that with a new mold this part will be an easy cast! Next the Engine, and the biggest surprise of the lot. The mold for this piece looked pretty disastrous with a lot of tiny undercuts caused by RTV seeping between panels. But the cast (again painted before i poured) is actually pretty good. Only a couple of air bubbles, and those seem to be where I was too slow pouring the resin and it's begun to set before complete. 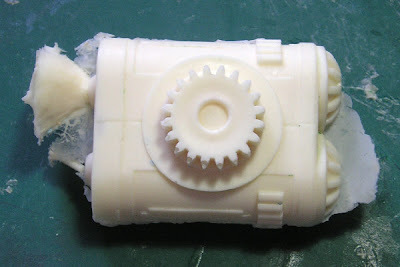 I think this mold might actually be usable when I have got a bit faster and smoother at the casting process. And the gear locating mechanism to pose the engines works a treat! Finally the piece I've always been worried about - The Landing Gear. Well, the good news is... it's not a complete disaster! The mold didn't fill completely and there are some large air bubbles in the corner of the feet, and the smaller 'leg' of the landing gear didn't fill properly with resin, but I think that's because I was slow (poured this after the tailplane from the same resin batch). I will need to adjust the master to fill in a couple of undercuts But i think this piece will then be fine with a new mold. The good news is that even with the problems on this test cast, the landing gear will be up to the job of supporting the main body! All in all a pretty good result I think. I'm a bit more optimistic than yesterday. I still think it might be worth trying the legs in low melt metal; this might flow better into the other bits of the mould. Plus would be a little stronger. So basically, what you are saying is that it wasn't nearly as disastrous as you first thought...so that's something to get enthusiastic about ;). I'm glad things weren't as bad as you thought and also that you managed to salvage something from the molds that you thought were ruined. Just take one step at a time and you'll end up with a really nice dropship. As I have said before, I am watching this with interest because I am looking to do something similar and you are showing me what can be achieved without too much specialist kit. Keep up the good work and enjoy your U.S. break! Another trick for getting the resin into those nooks and crannies is talcum powder. Lightly dust the mold with powder then shake it out. 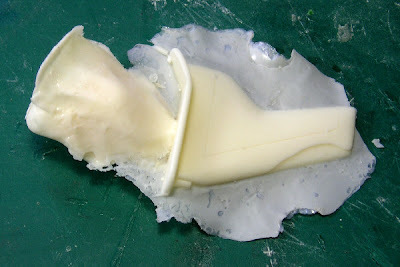 This will help pull the resin across the surface of the mold and into the corners.